CRM (Customer Relationship Management) plays a vital role in any small scale business, especially in the sales team for them to be organized and to close a lot of deals. CRM basically is sales oriented and offers management based tools to every department. We analyzed more than eighteen programs supplying a wide range of choices to recognize the best suitable for small scale businesses in terms of price, quality, features, and integrations. CRMs are of significant advantage to any organization for the sole purpose of maintaining contacts and tracking those activities that could be benefited to close deals. How to Find Out Best CRM Software for Small Scale Business? Nevertheless, a lot of CRM software includes advanced features like analytics, system integration, task automation, and many more robust features. And these functionalities are available at a high cost and are not suitable for many. Price: - Comparison of each program's monthly user fee and also add on costs that led to additional functionality. 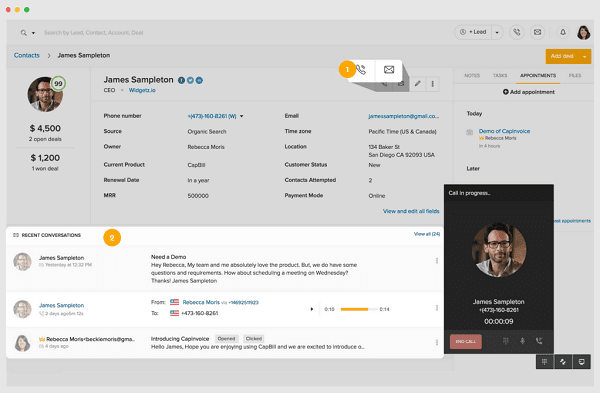 Contact management: - the ease with which you can create, edit and search for contacts. In addition to that, how individual tool dealt with email, phone calls and various other tasks. Deal and opportunity management: - to check how each tool keeps track of a deal's pipeline stage and how each tool prioritizes follow up activities. Workflow automation: - keeps track of each tool sales related methodology and other follow up tasks. Reporting tools: - examines the data that is readily available to help sales managers monitor their teams and also regarding sales pipelines. System integrations: - comparison of individual tool’s integrations with third-party programs on the cloud. Customisation: - ensuring how each program maintains customisation like contact fields, opportunity fields and sales processes. Customer satisfaction: - going through all the product reviews for better implementation. 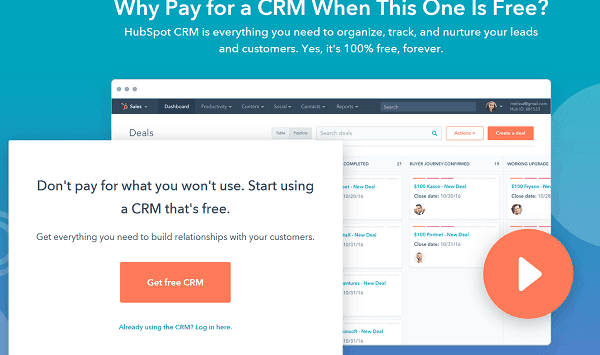 HubSpot CRM is something you can afford and is known for its great features. 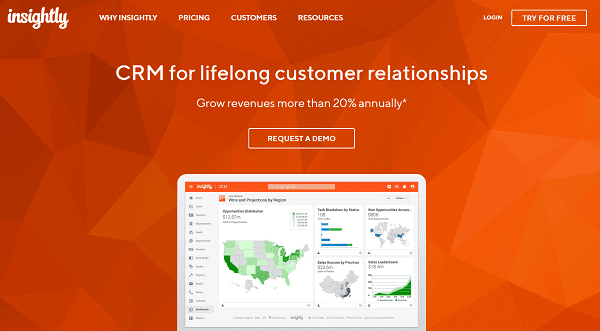 Any business could actually consider this CRM as it easily blends with any software. It has an intuitive interface hosted in the cloud; therefore you don't have to worry about any complicated hardware installation. It is capable of monitoring multiple sales processes due to which it helps the business close more deals at a faster rate. You can find a in-depth comparison between Hubspot CRM vs Salesforce on PieSync. Freshsales is a personalised CRM with a lot of features, that offers contact and lead management created exclusively for long sales cycles. It has some basic features which are free for teams of all size. In addition to that, it has a mobile app that shows all the tasks, appointments and meetings in a single calendar view. You also have an option to make a call or send emails, thereby making it a fantastic CRM for business to business (B2B) teams that requires a highly personalized CRM having remote users. A simple and easy to navigate interface along with robust features is very important to validate the organising of almost aspects in the sales process. There's no necessity of other programs to get your work done. Freshsales has also collected most of the functions from legacy CRM systems but owns a way to optimise sales, prioritise pipeline opportunities and constructing a robust system for the sales team. Salesforce Essentials is known for its free G suite and you can access it for 3 months free of cost. The connected solution is obtained from the partnership between Salesforce and Gmail, Google Docs, Google Drive, Google Calendar and removes redundant data. It also has a simple setup assistant like in-app tutorials and guided setup that helps in setting up the software. It also has a trailhead that provides interactive learning to understand Salesforce in a better way. Automated processes like syncing emails, meetings and other valuable information to your inbox directly are done by it. Salesforce Essentials is highly scalable in terms of data storage and you don't have to transfer the data as and when your business grows. Pipedrive provides a complete overview of the sales pipeline and it is specifically designed to assist companies in monitoring deals in different stages of sales management so that they have their entire focus on particular customers and have high productivity. They focus on right activities and deals from various sales stages so that you are aware of your sales teams progress and gives you a clear cut idea as to which deal needs to be prioritised. It personalizes everything right from the creation of custom products linked to deals and clients. It is entirely personalized and lets you switch off the features that you don't actually need. It's super easy to plan events and schedule business meetings using pipedrive and I bet you won't miss any of the appointments! In addition to that, you can also sync essential data frequently, forward documents and allocate tasks to your agents. Insightly gives you a complete insight of your project as it provides both macro and micro views of your activities, tracks, projects, tasks and deadlines, and also analyses progress to help you better with upcoming opportunities. There is a relationship graph engine that automatically captures the connection between organisations and business relationships they share. Apart from that, they also offer standard business reports based on your day to day activities. 360-degree view of the customer is taken into consideration for an organised customer data. Currently, we are facing a rapid shift to mobile CRM solutions with a wide range of businesses able to select a CRM for helping numerous mobile devices. Studies prove that making use of such tools has led to an increase in sales productivity (up to 14.6% on an average).